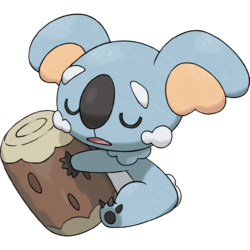 Komala in game: 1,267 Who? Important notice! Pokemon Komala is a fictional character of humans. 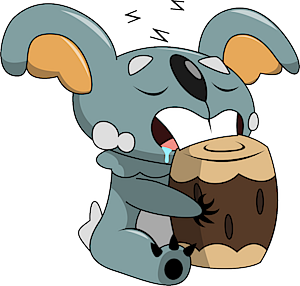 Komala (Japanese: ????? Nekkoara) is a Normal-type Pokémon introduced in Generation VII. This Pokémon has never been seen awake. While its expression sometimes changes as if it is aware of its surroundings, this appears to be a result of its dreams instead. It is able to eat, travel, and even battle without waking. If the log pillow it clings to is removed, it will be unable to sleep well and thrash wildly. However, it will sometimes cling to the arm of a Trainer it trusts. According to ancient people, if a small amount of the saliva created when it eats leaves is watered down and ingested, one will be able to sleep well. A wild Komala living on Melemele Island first appeared in The Guardian's Challenge!. Nekkoara may be a combination of ??? nekko (root), ? ne (sleep), ? ko (young animal), and koala.